For a non-lemons project I bought a 1987 BMW 528e (M20, 2.7L engine). This thing uses Motronic 1.0. There are no less than 3 separate systems to deal with the air/fuel for idle etc. But I digress. I'm going through this thing pretty thoroughly. I'm on the front of the motor right now. Water pump, timing belt, cam, crank & intermediate seals, rocker cover and oil sump gaskets, etc. The thermostat housing is two pieces. The bigger of the two has 4 (FOUR!) temperature sensors: 1 for the main ecu, 1 for the gauge and 2 more for idle control. 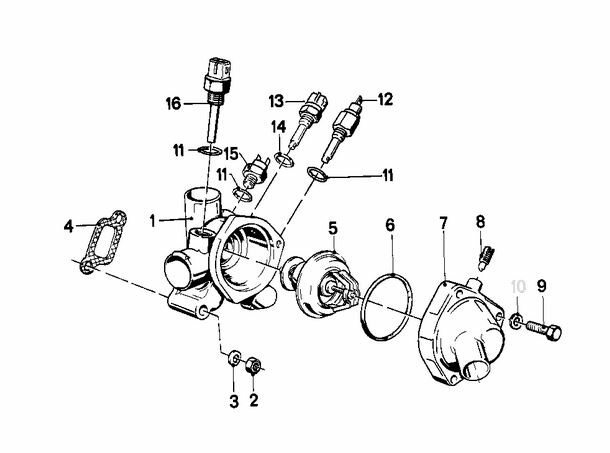 Most replacement parts are readily available, for example the thermostat housing. Cheap and easy from URO and available through amazon, rockauto, etc. I start taking apart the thermostat housing that has all four sensors and the temperature switch falls apart as I start to take the leads off of it. It has two spade connectors on top. I don't think too much about this as I already bought the a replacement for the Bosch ubiquitous CLT sensor. I get to the computer and look up the part number on RealOEM and start searching. Nothing. What I do find at some of the usual BMW parts sellers is that this part is NLA-no longer available. They used this part on a fairly wide range of cars in the 80s but no one seems to have any of them around. Specifically, this is a 45*C, normally open temperature switch. I guess what makes it unique is the relatively low operating temp. 45*C is only 113*F. Kind of an oddball temperature for engine coolant. But like I said, the whole thing is oddball. In any case, Ive posted on the e28 forums and there is at least one guy looking for a salvage part. My inquiries at the usual suspect BMW parts shops have turned up zero. I'm going to take a look at this thing and see if I can fix it. 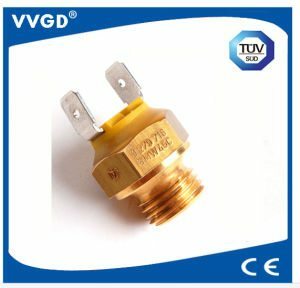 Solder new terminals? Seal it with silicon? Not sure. First I will test it to see if it even works. I brought this issue here because of the various automotive forums I frequent, Lemons seems to have the best balance of ingenuity and resourcefulness. During all my Google-Foo on this subject I did find a link to a generic 45*C, NO temperature switch. Form factor is off and the thread is wrong but it could work, if it works. Since its a switch I don't believe there is too much it has to do to work. Sounds like a job for an arduino, a relay, and a one wire temperature sensor. Even easier, Just grab these, and pot them into a gutted temp sensor body and call it a day. 45°C Normally Open Thermal switch. There's also this style, but I think they'd be harder to work into the stock form factor. I like this. Just out of curiosity, what would you pot it with? I assume thermal conductivity doesn't matter too much as long as the business end of the switch is in contact with the metal housing. Thermal conductivity does matter a little. You want the sensor getting heat transfer over most of it's casing to make it react quickly. If you're only inputting through a tiny little contact patch, it will react slowly. But that's the engineering answer, and it likely doesn't matter too much here. You can try JB weld, but it's thermal conductivity is roughly half that of a proper epoxy or potting compound. Might not matter much here, since clearly the sensor is just trying to tell some system that your engine is up and over a specific temp that is well below operating temp. You might tell the system you're good 10 degrees higher than normal, but i doubt that matters much. If you want to do it right, you get something like 3M TC2810 which is a 2-part thermal epoxy. But it's pricey, especially if you don't own one of the applicator guns. There are cheaper options, some epoxies, some silicone based, all would work just fine. If that's the one that turns on the electric fan, then I replaced the one in my BMW track beater with a relay that just leaves it on all the time if the car is on. I also replaced the fan with a 16" SPAL fan. Mine is on an E30 with a M20 2.5, and it's been like that for a couple of years with no ill effects. Oh, if it's just a fan trigger, abandon it with no worries. My solution was given assuming it was required by one of the computers. No, its not a fan trigger. It is part of the overly complicated Motronic 1.0 idle control system. It closes at only 45*C.
Will it run cold if you permanently close the circuit? Yeah, I'd say any switch that closes at 45c.... Can be permanently closed. If you're south of MN, how long is the engine temp EVER going to be below 45c?